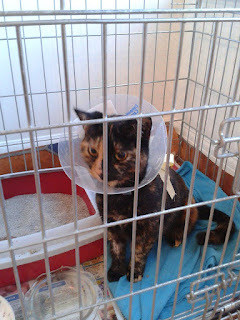 Today is Treacle's big day, off to the vet for her op. She has a bladder stone! and hopefully she'll be all sorted I hope so because she's been causing havoc around the house with her accidents (yuk) I'm now a bit of an expert at getting rid of THAT smell. Obviously she was a reluctant patient and made all sorts of complaints about going. And to be blunt my wallet is making quite alot of noise too. Vets fees are pretty steep. However I think if you take an animal into your home you should be prepared to look after them whatever. It's what credit cards are for as far as I'm concerned. I know some people would say it's not worth it but I'd rather spend my money on my cat instead of a flash car, fancy clothes or expensive holidays! So here she is all angry and sore, bless her. And one bladder stone less, thank goodness. We've had to put her in the pen because she is a master of escape, somehow she got out of her travel box and into the garden 5 minutes after getting home! The other two cats are keeping their distance, proper scardy cats. Lots of treats await and I'm sure it won't be long before she's back to lounging in the sunshine. Lots of tablets and medicine to give her so a bit of nursing duty for me this weekend. Well still no news for my Mum, she's still waiting to find out why she's in agony when she walks around. Thank you Sharron, Treacle had a little melt down this morning and complained so much I let her out of the pen and took the collar off. She's much calmer now and has promised to be a good girl and not lick her tummy as long as I don't put her back IN THERE!! !